Spent an enjoyable four weeks in Las Vegas, taking some time off the road and visiting our youngest daughter and her family. Suzie, Kevin, Jack (age 7) and Tucker (age 5) live, work and play in this town, one of the most interesting and misunderstood cities in the world. 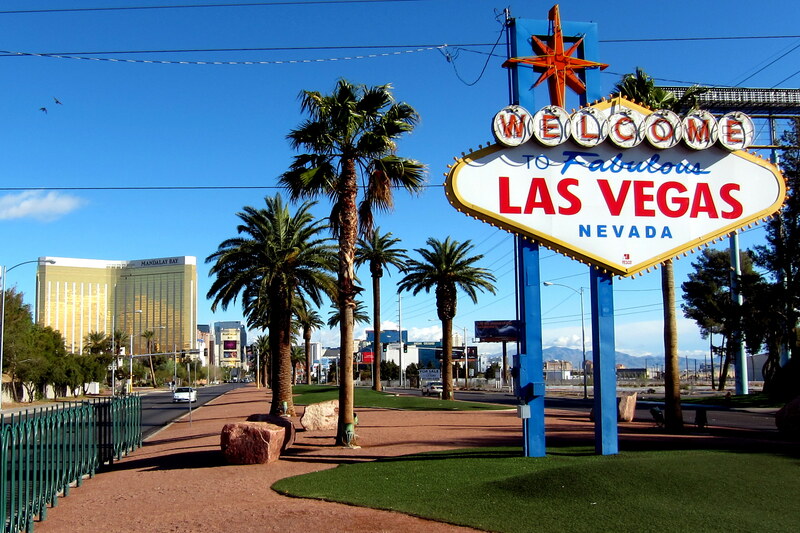 Las Vegas comes by its handle “Sin City” naturally and most citizens accept, or even embrace, their town’s notoriety. 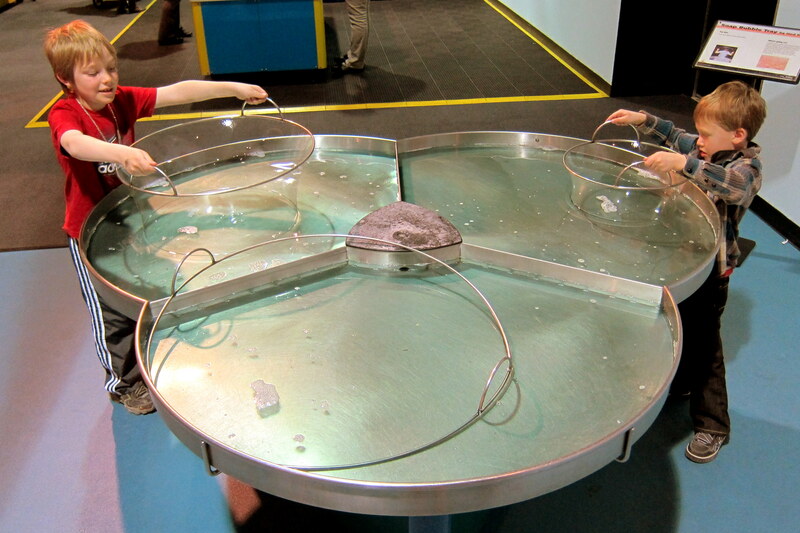 It’s obvious that a need exists for a place where folks can visit, be entertained and let off a little steam. Otherwise, some forty million people that visit annually would not bother. In my opinion, Las Vegas is the most non-hypocritical municipality in the United States. The city administrators support what takes place here and frequently lobby for more of the same. In many other cities similar activity goes on, however it is usually underground…..not being legal, regulated or taxed. The entertainment district is a very small part of this diverse city. There are numerous other business, museums, factories and world class parks spread about. There are many diverse outdoor opportunities around Las Vegas and even skiing up in the mountains. In addition, Las Vegas is a prime staging area for visits to some of the United States best National Park’s located in Arizona and Utah. Kit and I are generally pretty nomadic on these trips, staying only a few days at any one place…..however we usually stay a few weeks in Las Vegas. Our two youngest grandchildren live here and we only get to see them about twice a year, and we all know how fast grandchildren grow. The last point was startlingly evident to us when we first laid eyes on Tucker. 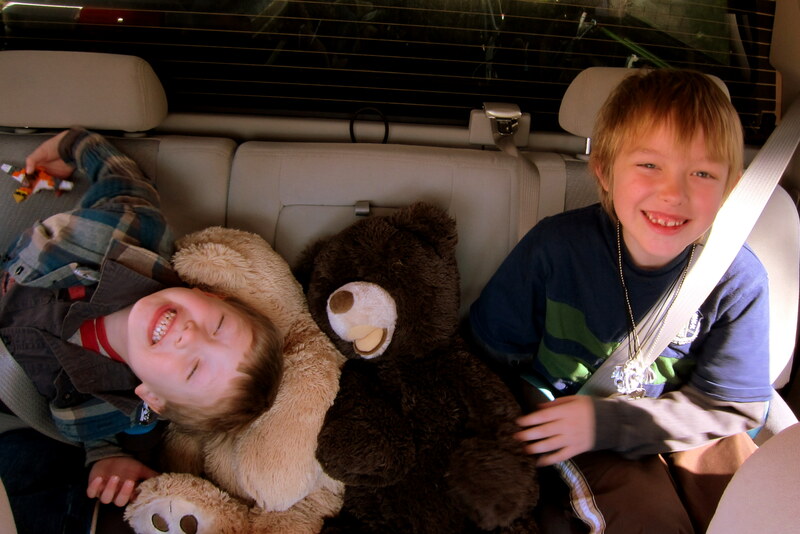 Both boys are both bright, inquisitive, and a blast to be around. Tucker is a bit more mischievous and Jack is at the age where everything is wondrous and requires detailed exploration and endless questions. 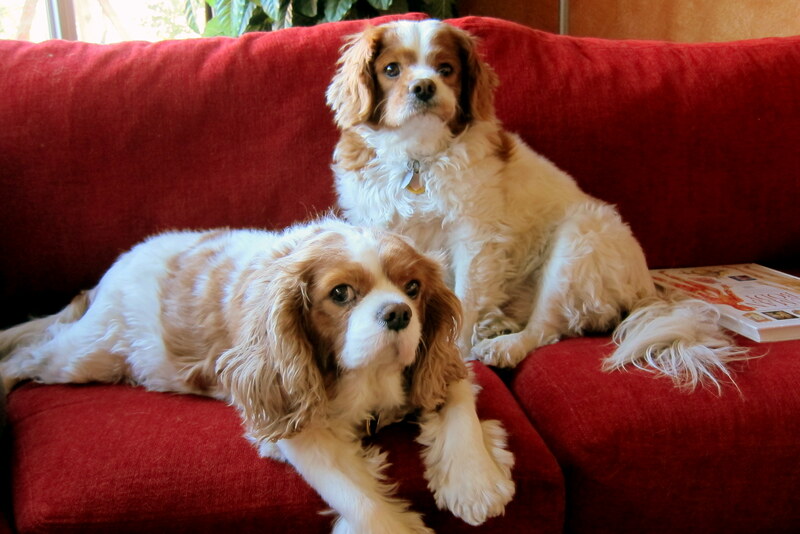 Jack and Tucker have two partners in crime…..Toby and Rosie. These four contribute equally to the fascinating chaos that transpires daily in the family home. 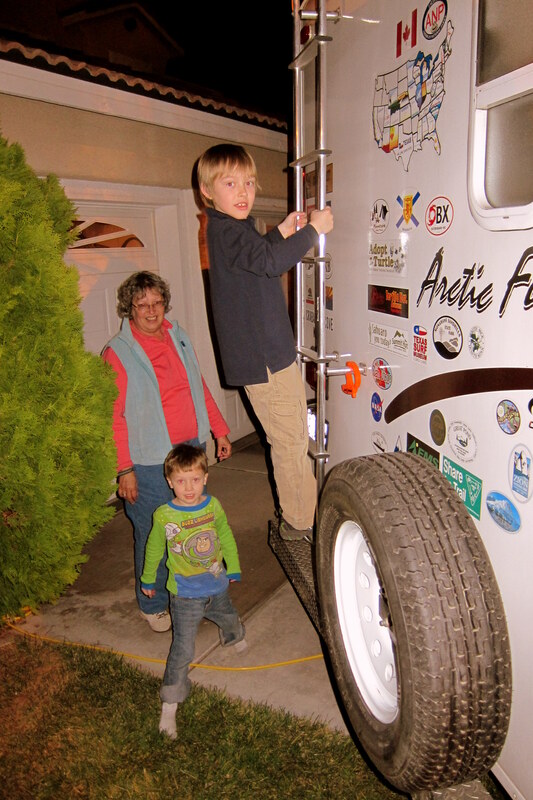 One of the first orders of business was for Jack and Tucker to help set up the trailer for a few days of dooryard surfing. 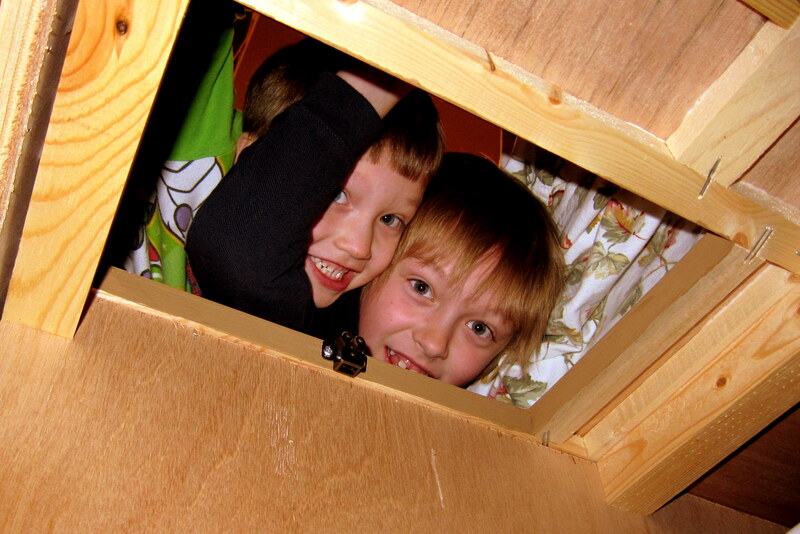 After which they proceeded to explore every nook and cranny of the camper. They were amazed that our dinette transformed into a bed and pleaded with their folks for permission to sleep in the camper with Guma and Poppy. Suzie and Kevin readily agreed so, after telling a few camp ghost stories, we all fell into a restful slumber. Saturday morning dawned sunny and warm with cobalt blue skies. 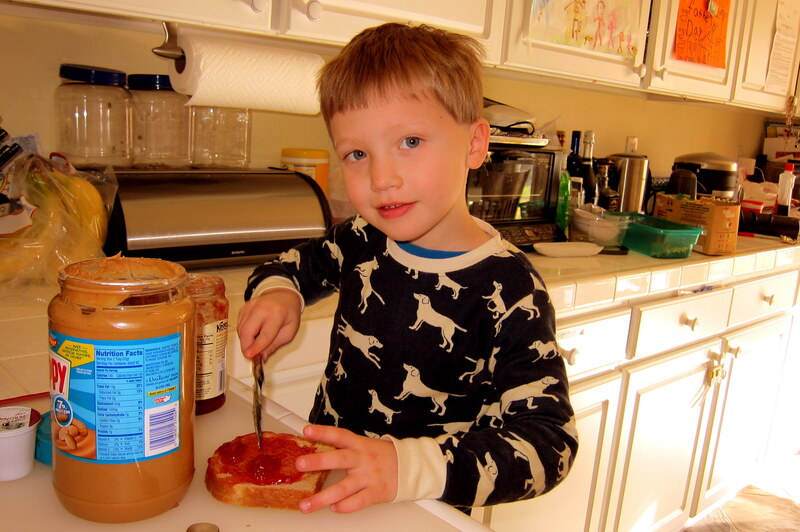 So into the house we quietly trooped and while mom and dad got some well-deserved sleeping in time…..Tucker volunteered to make breakfast. Fueled up, it was outside to enjoy a beautiful southern Nevada day. Jack and I went mountain biking in a field near their home. 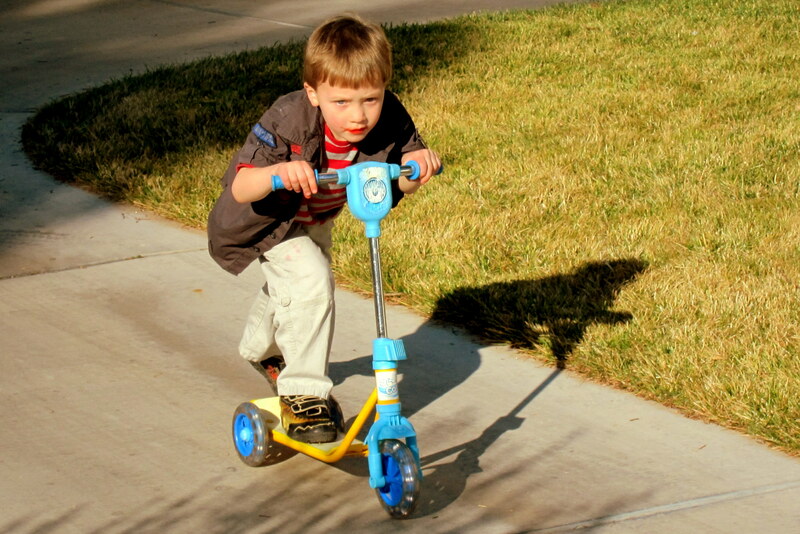 While Guma watched Tucker ride his scooter round and round and round to the point of her exhaustion. The kiddles also enjoyed just lounging around their dooryard campsite. 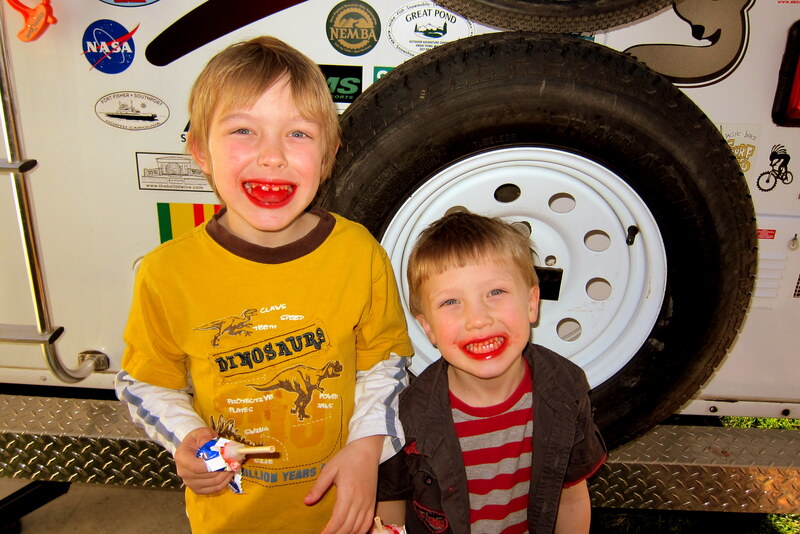 Until they heard the universal jingle of the Ice Cream Man and both took off like a shot with me in cold pursuit. Can you tell which flavor of Popsicle’s they chose? 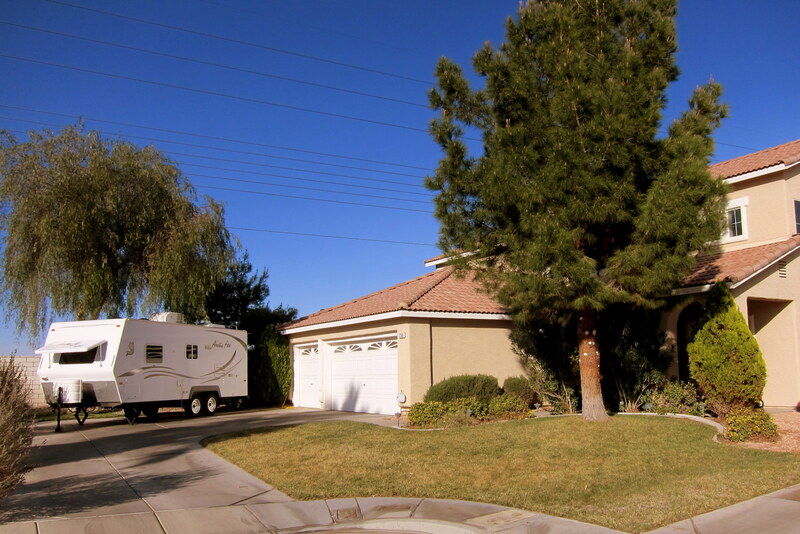 We enjoyed a great couple of days playing, visiting, playing, eating, playing and even got some playing in……however it was time to move to our traditional Las Vegas campsite at Nellis Air Force Base just to the north. 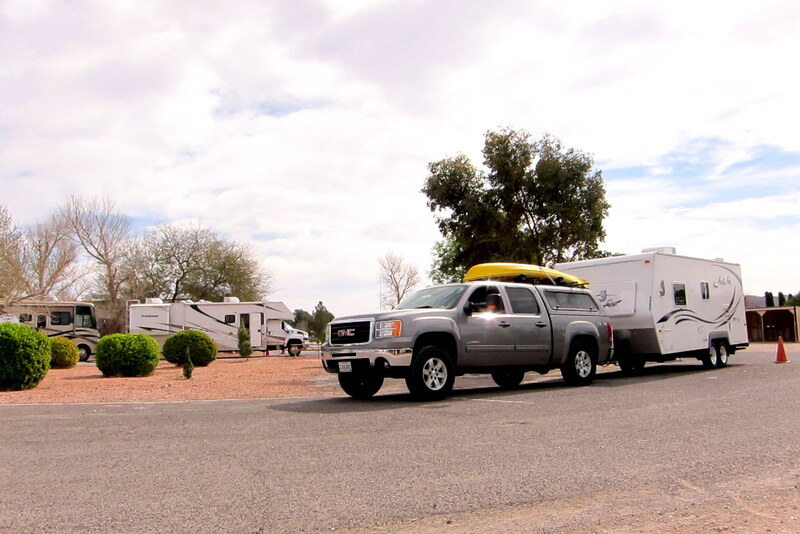 Staying in the kid’s driveway is always nice but it does disrupt their schedule a bit, and with us staying in the area for a few weeks it works better for everyone if we set up at an actual campground. 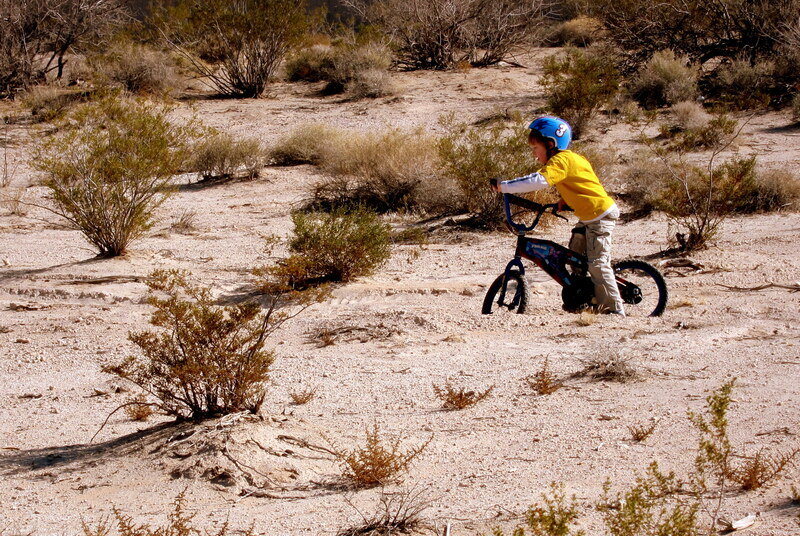 The campground at Nellis, called Desert Eagle, features numerous sites and plenty of overflow capacity for dry camping. We were only able to score a partial hook-up site because the NASCAR boys are coming to town and the main park was full. 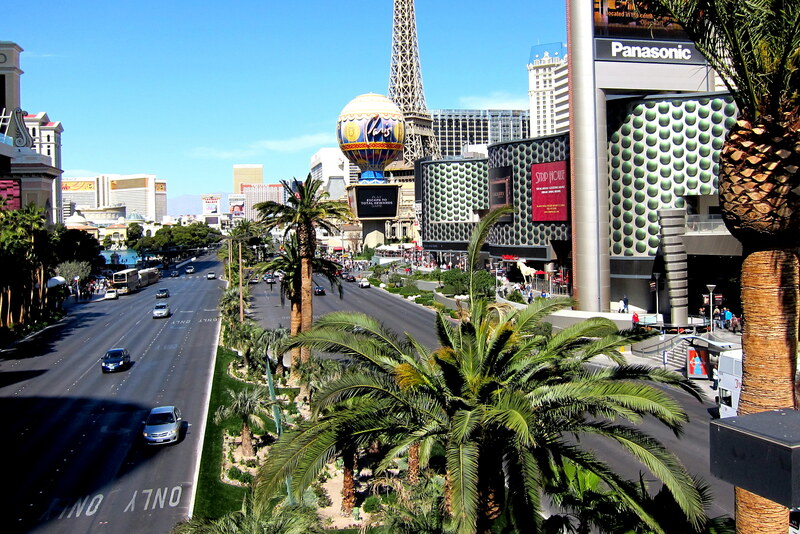 Yep…..we just happened to be in Las Vegas when the tour came to town. Kit thinks it was planned, but honest it was just a co-ink-e-dink. Considering that one of my bucket list items is to see a NASCAR race and Kit was in need of some quiet reading and knitting time it turned into a win-win for the both of us. Early on Saturday, I headed out to the track…..a mere 4 miles down Las Vegas Boulevard from the Air Force Base. During NASCAR weekend hundreds of thousands of folks show up and most visit the area to get in some gambling and partying before coming to the racetrack. After parking my truck, one of these guys pulled in behind me and misjudged the distance a bit. He and his buddies were pretty hung-over and therefore nonchalant about the mishap. Since my truck suffered no damage we ended up laughing about the incident. 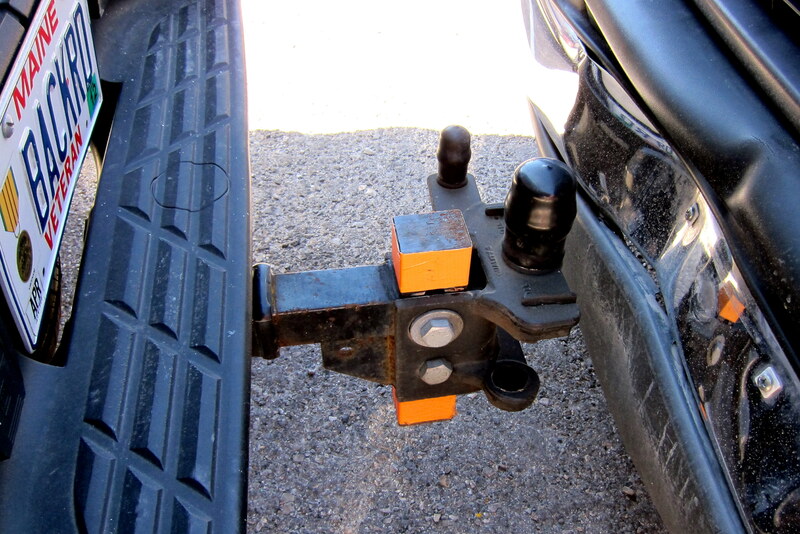 I usually keep the trailer hitch on the truck and attached the orange strips to help prevent mishaps such as this…..oh well. Now for those that live and breathe all things NASCAR, my apologies……even though I’m a car nut and have notched previous bucket list items such as attending national level Indy and NHRA races, I have little knowledge of NASCAR. So, if you are a NASCAR fan, feel free to just skip over this whole next section. 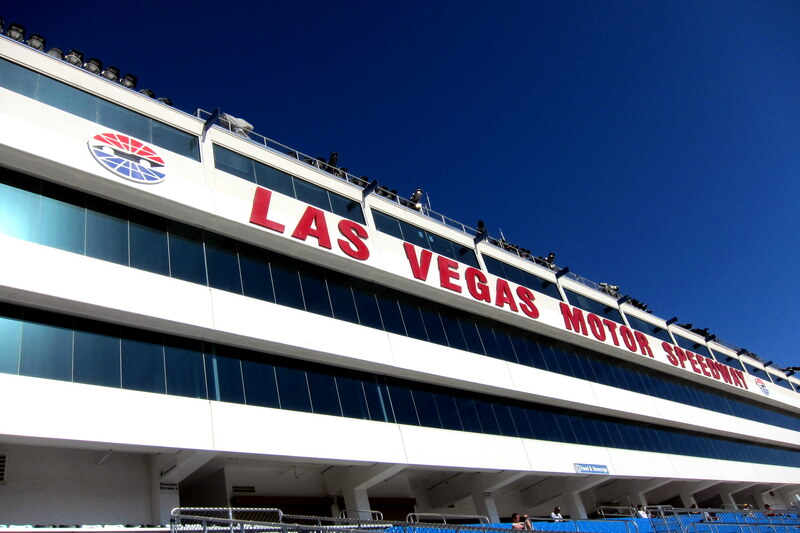 Las Vegas Motor Speedway (LVMS) is fairly new and a very well designed complex. Getting the 150,000 spectators to the track, around the facility and out at the end of the day is a study in extreme crowd control. 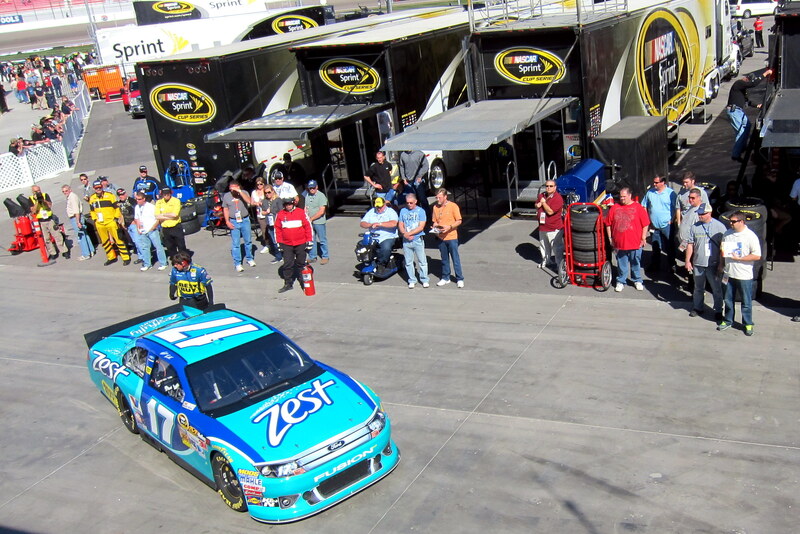 They LVMS folks do this effortlessly and have the enjoyment of the fan in mind at each step of the way. 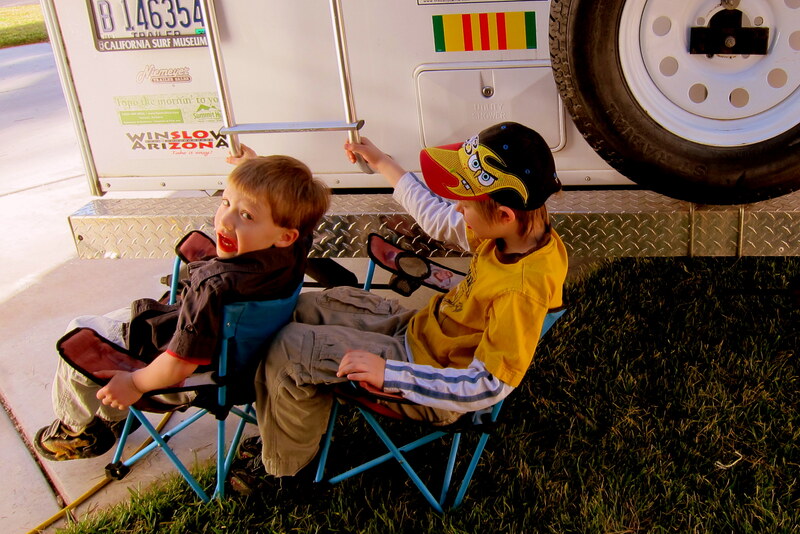 Some folks follow the NASCAR tour from race to race in huge, expensive motorhomes and trailers. Just parking one of these things can set you back from two hundred to over a thousand dollars depending on how close to the track you want to be. There are actually four racing surfaces not counting the roads into and out of the place. Something about going to a race…..some folks like to pretend they are Bobbie Allison as they leave the track. NASCAR stands for National Association of Stock Car Racing. However there is nothing stock about these pure bred racing machines. They don’t even look stock from underneath. I don’t think these cars could be driven anywhere near Boston as they don’t have horns. However each driver does have two middle fingers so they might qualify as Massachusetts transportation after all. This particular track is a tri-oval, 1.5 miles around and features 20 degree banked corners. This helps keep the drivers from flying off the while turning left at over 200 MPH. The grand marshal for today’s race was Oscar Goodman, the former mayor of Las Vegas. He showed up on the podium for the drivers introductions with a martini in hand and flanked by two show girls…..another example of this town promoting its unique status. A neat feature of this track is called The Neon Garage. 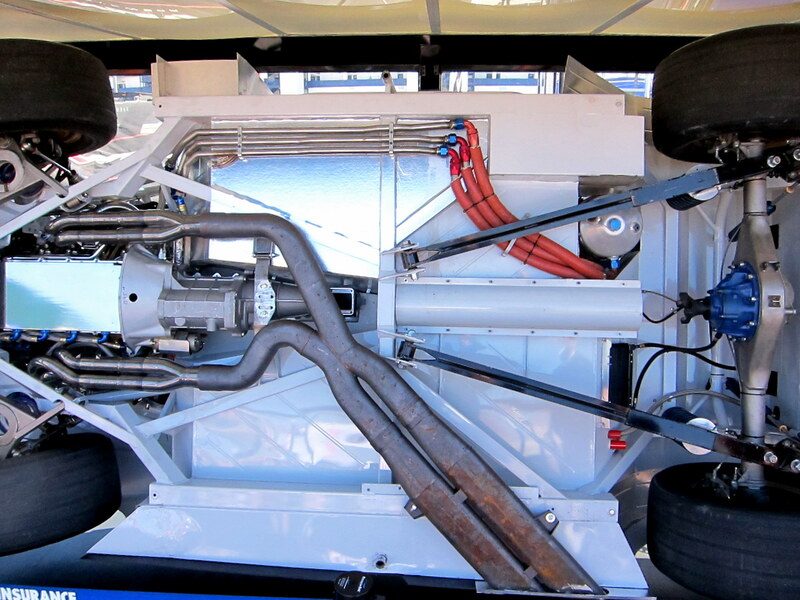 This area has live entertainment and unprecedented access to the drivers and their garage areas. It was a blast to watch the drivers come in, get their cars worked on and listen to the race chatter. A virtual NASCAR Disneyland! One thing that I noticed is that NASCAR fans are intensely loyal to their individual driver and engage in good natured bantering with other fans that support a different team. In addition they are very friendly and helpful to a newbie like me. Not knowing who was who, I just watched where the folks wearing the NASCAR clothing, which by the way were covered with team sponsors logos, and went wherever they went. I did end up asking a ton of questions of those around me and learned a great deal about the various drivers, cars and race teams. This fellow seemed to always draw a crowd. He is the son of the late, great NASCAR champion Dale Earnhardt and an accomplished racer in his own right. This guy received a lot of attention as well. 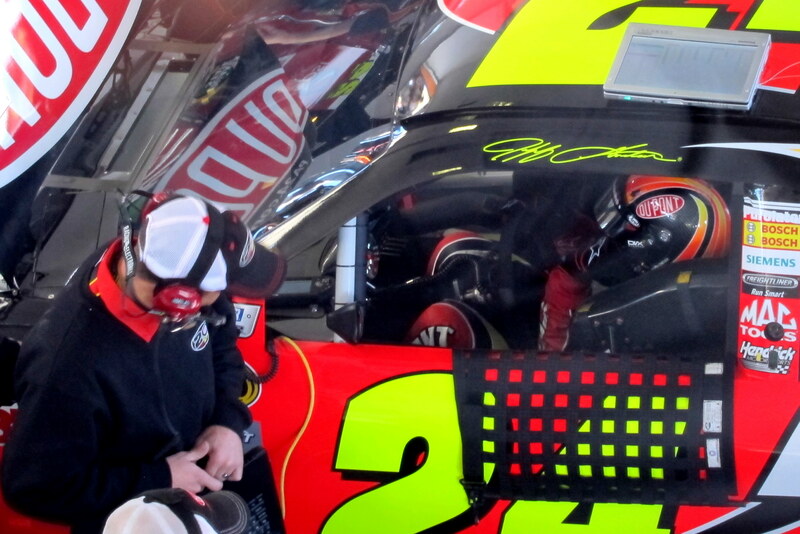 That’s Jeff Gordon, a multi time NASCAR Sprint Cup champion and one of the poster boys for modern NASCAR racing. 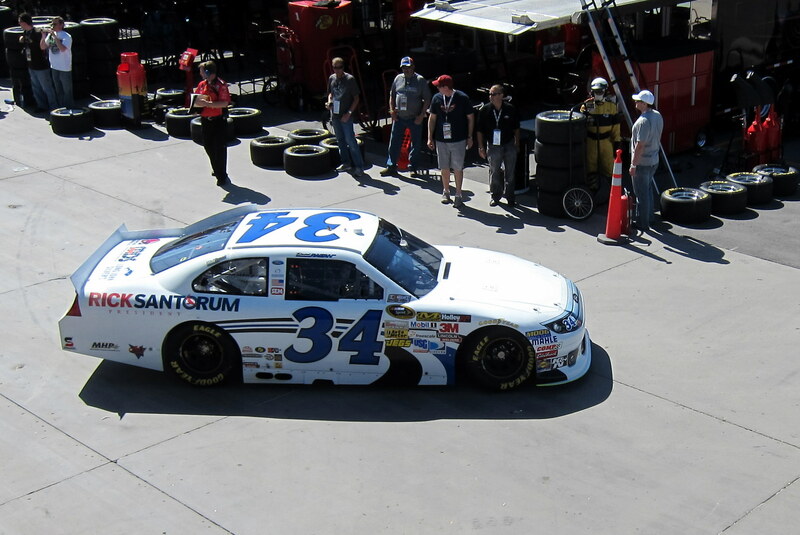 Not sure who drives this car, but the word in the pits is that he is really cleaning up in NASCAR. 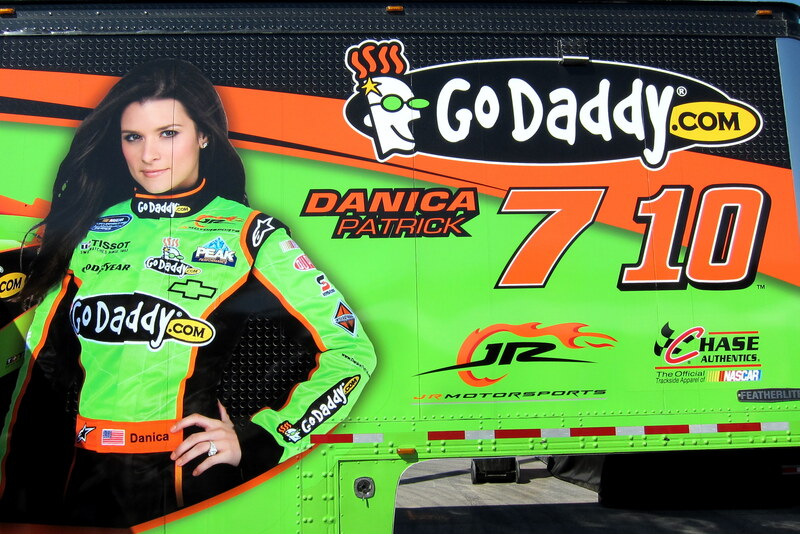 An up and comer on the NASCAR circuit is a young woman by the name of Danica Patrick. 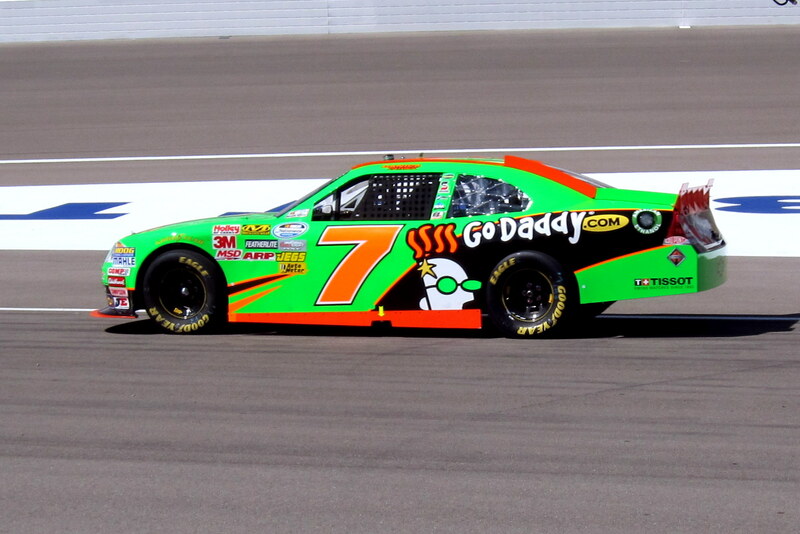 Formerly of Indy Car Racing, Danica has made the transition to NASCAR and races in the Nationwide Series. 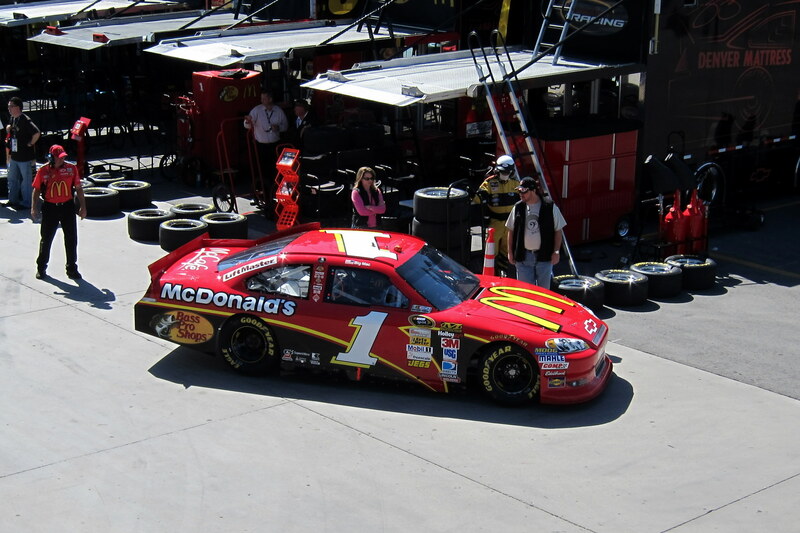 At Las Vegas, she did well and at one point was in the number 4 position before falling back to finish 12th. Speculation is that her first NASCAR win is imminent as she has succeeded in every other form of motor racing she has participated in. There are multiple levels of racing in NASCAR. 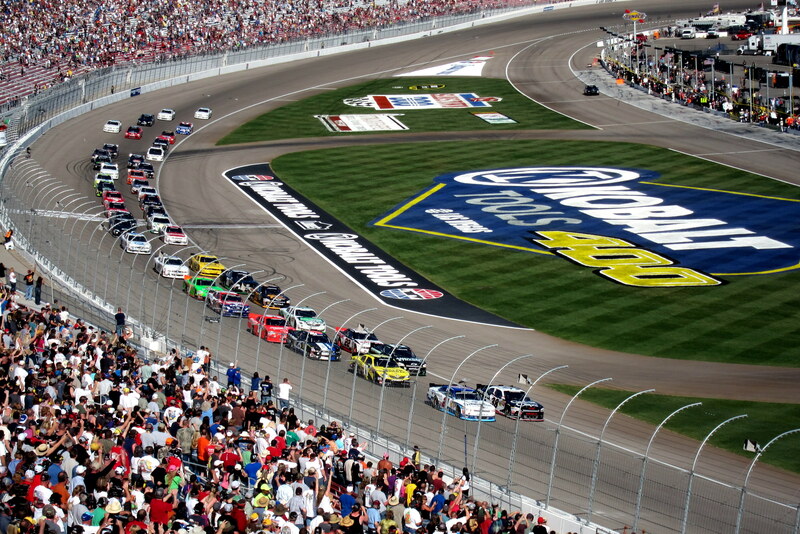 The big boys race in the Sprint Cup and the next tier race in the Nationwide Series. In addition there are numerous regional levels of lesser known drivers. 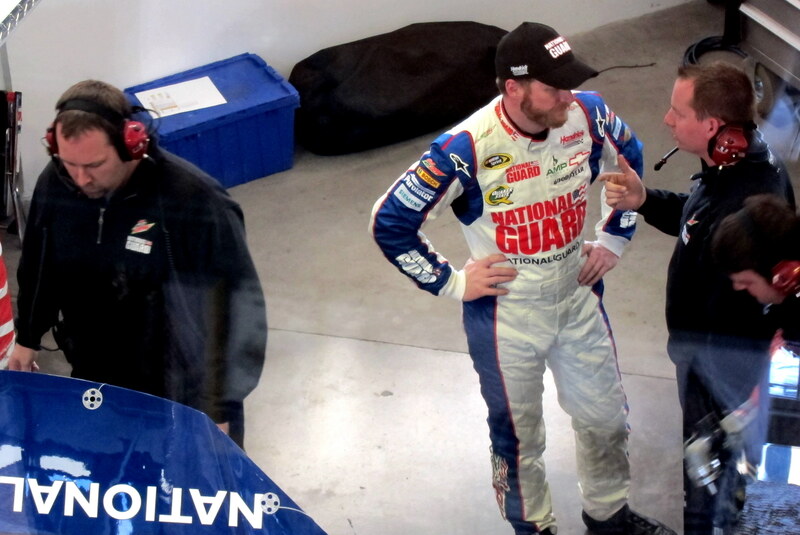 The race I enjoyed was in the Nationwide series, although a number of Sprint Cup drivers raced as well……clear? Actually there is a ton of NASCAR lingo that one has to learn in order to truly understand the sport. Until this past weekend I thought a Sprint Cup was a device that elite runners wore to give them an aerodynamic advantage and a wedge was that undergarment thing. 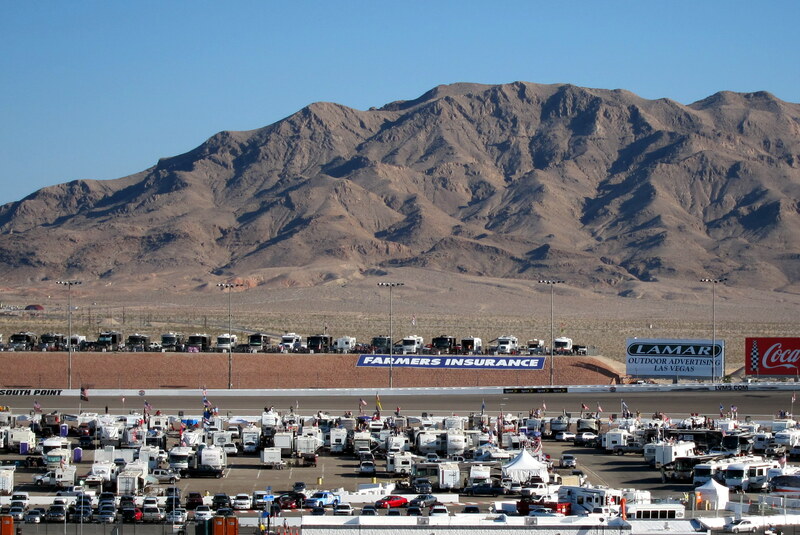 The Las Vegas race in the Nationwide Series is called the Sam’s Town 300…..a 200 lap event that lasted for about three hours. The sounds, sights and smells of a national event like this can only be imagined by those watching the race on TV. The actual sensory load and visual excitement is incredible. Occasionally politicians get involved in NASCAR as well. Which makes sense as they are already accustomed to going in circles, making a lot of noise and being supported by corporate sponsors. Poor Rick did not fare too well because on the first lap of the race, when the field turned left he went right and ended up in the crazyland. 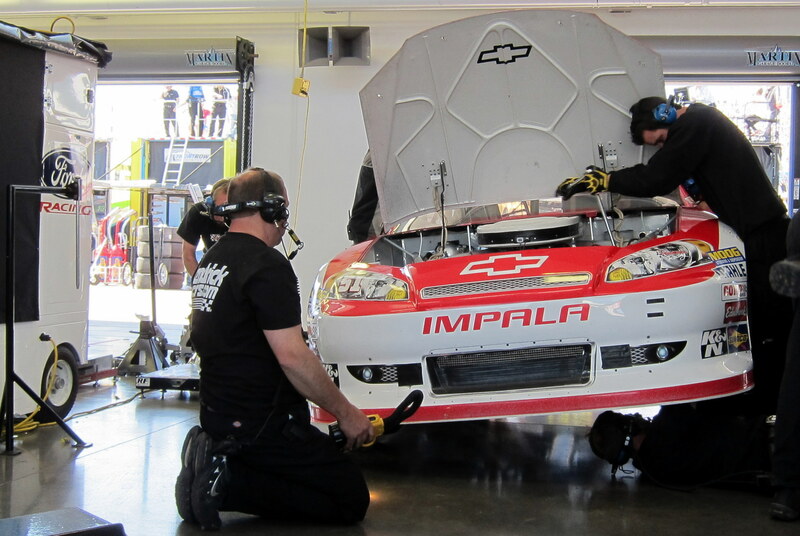 A great day of racing at a great track…..might have to see the big boys run here someday in the Sprint Cup series. 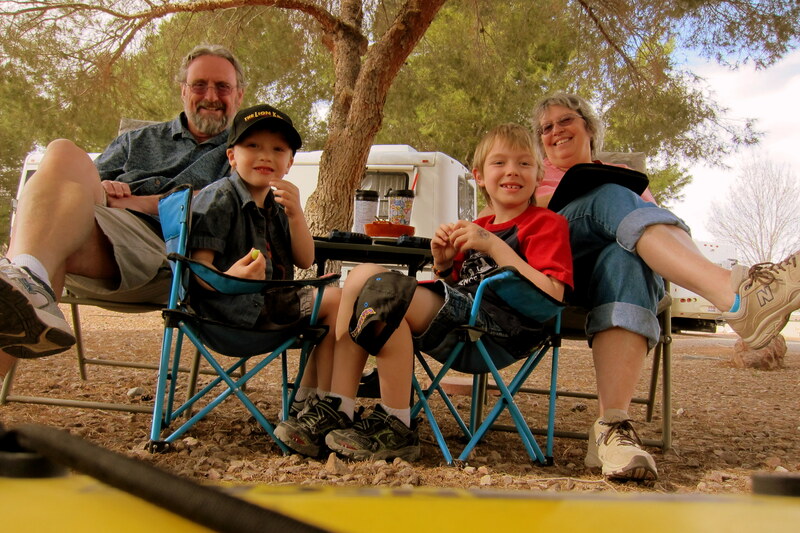 We were able to have the kiddles out at our Nellis campsite on two consecutive long weekends. Not only does this give us some quality time with Jack and Tucker, but it allows their parents to have a break and go off on a mini vacation of their own. Don’t the parents look sad? And don’t the kiddles look happy? After a run through Savers, a west coast store featuring quality previously used items, we made the obligatory stop at In and Out Burger. Arriving at the campsite by early afternoon we enjoyed the fresh air and each other’s company for the remainder of the day. During the three days it seemed that we were constantly on the go. There were playgrounds to explore. 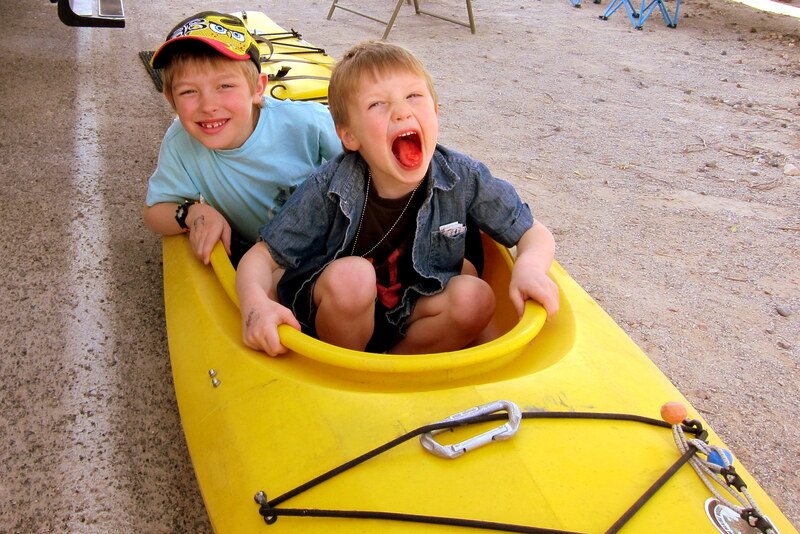 And Poppy’s kayak to play in. And lots of running around and games to play. At the end of each day everyone dropped off early and had a restful night. 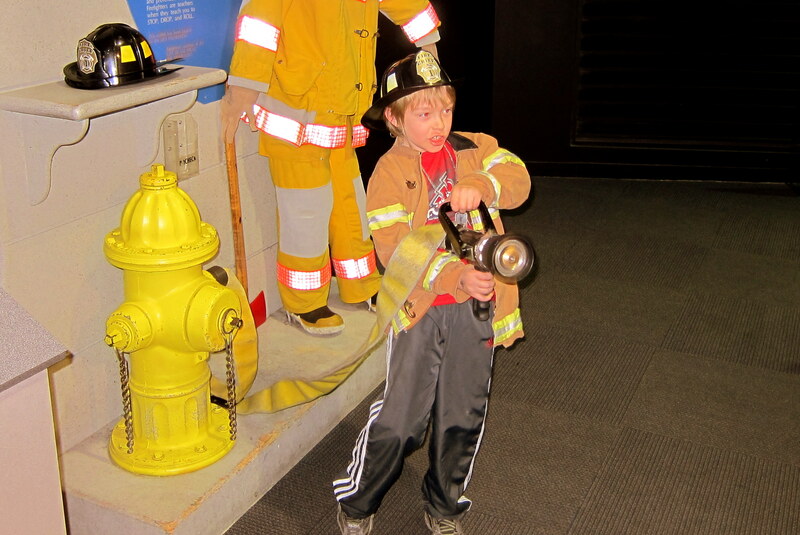 On one of the camp day’s we took the kids to The Lied Discovery Children’s Museum. 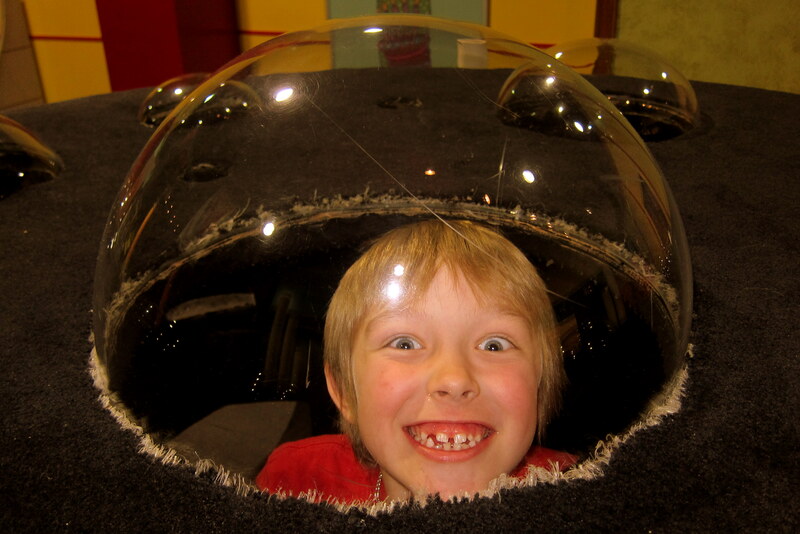 This kid friendly museum features over 100 interactive displays. 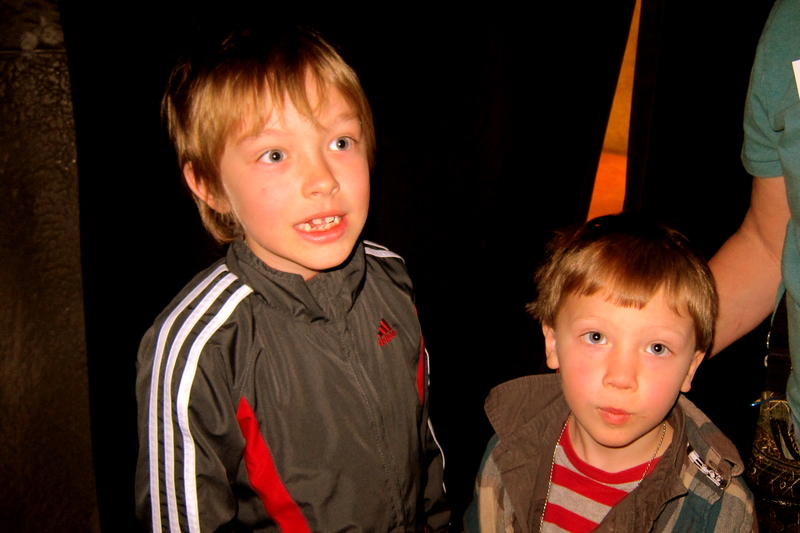 Jack and Tucker waited patiently for the doors to open…..this was going to be a fun day! 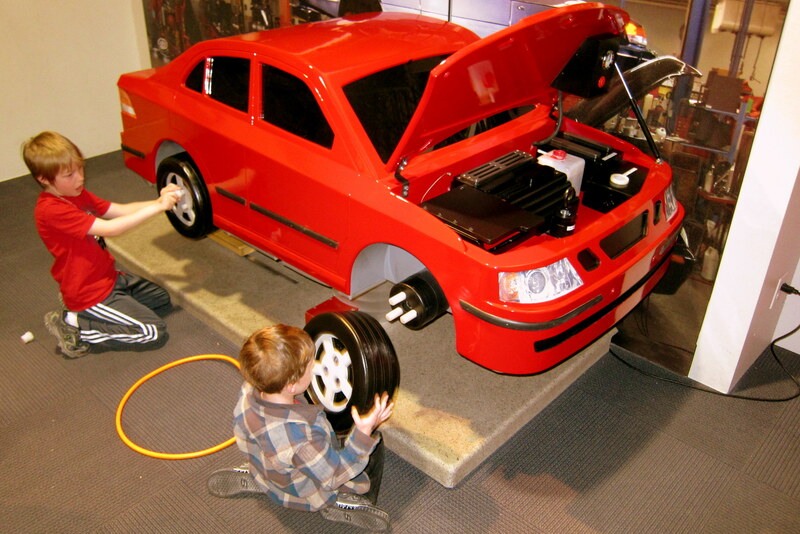 There are exhibits on different occupations where you can try out the equipment. There are places to climb up, on and in. 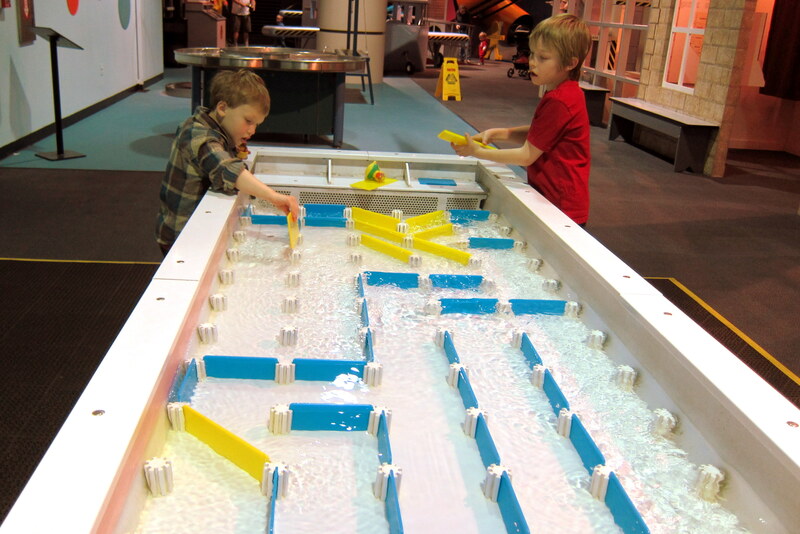 There are displays of hydro dynamics and controlling water flow and velocity. We spent six fun filled hours at the museum and will need to return in order to further explore this unique and fascinating place. 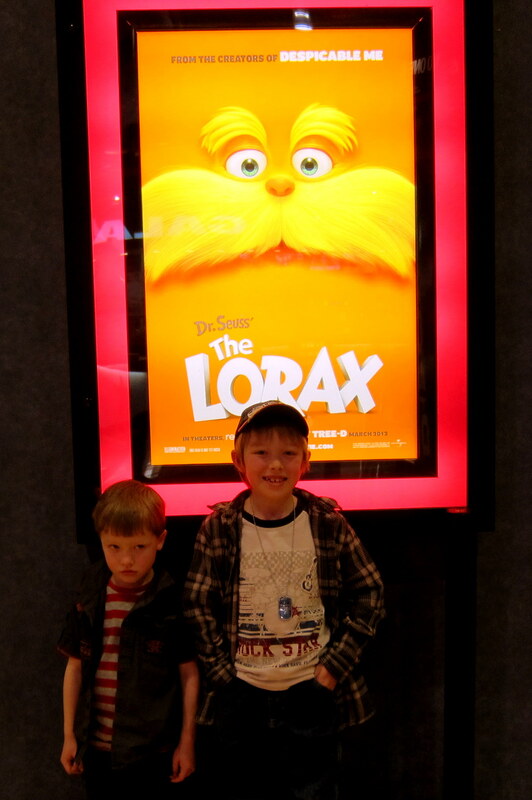 It was opening weekend for the new movie based on the Dr. Seuss book “The Lorax”. On another camp day, we treated ourselves and the kiddles to the film complete with buckets of salty popcorn and gallons of watered down soda. The movie was true to the book, contains a valuable lesson, and is adult friendly…..we highly recommend everyone make time to see it. Dropping the kids back off at their home after three delightful days, Kevin surprised us with comp tickets to see Cirque du Soleil “O”, one of the longest running Cirque shows in the US. So off we went to the LV strip. One of my favorite pastimes is people watching, and this town is the greatest people watching venue in the world. Folks from all over come to Vegas and turn into their alter ego’s. It is not uncommon to see Asians dressed as cowboys and housewives from Peoria dressed as hookers. It is also a major hangout for the area’s homeless…..every block has panhandlers looking for financial help with shelter and food. However unique to this trip was the number of homeless that had acquired pets and only wanted money to feed their pet. Last year they all claimed to be combat veterans…..I guess whatever works to scam money for booze. After walking the strip and enjoying a meal at the Bellagio we stepped outside just in time to witness this spectacle. 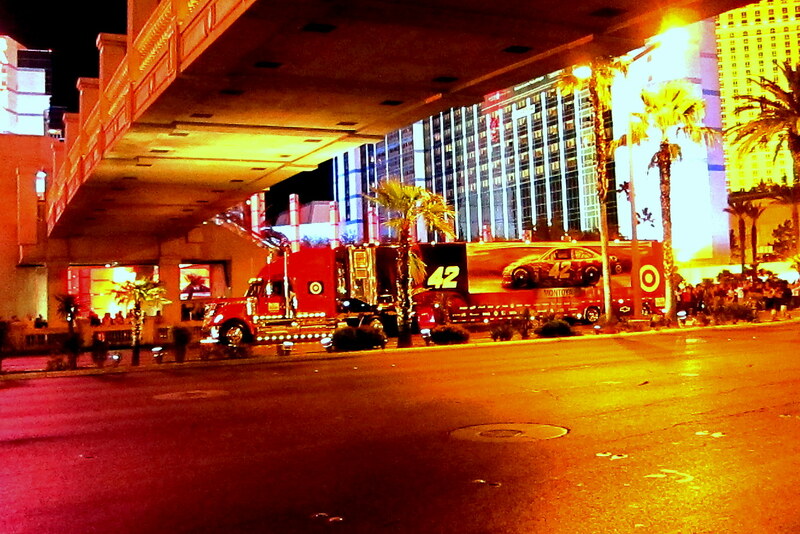 It was the traditional “Hauler Parade” where the NASCAR car haulers drive down the middle of Las Vegas Boulevard with horns honking and people waving from the sidelines. 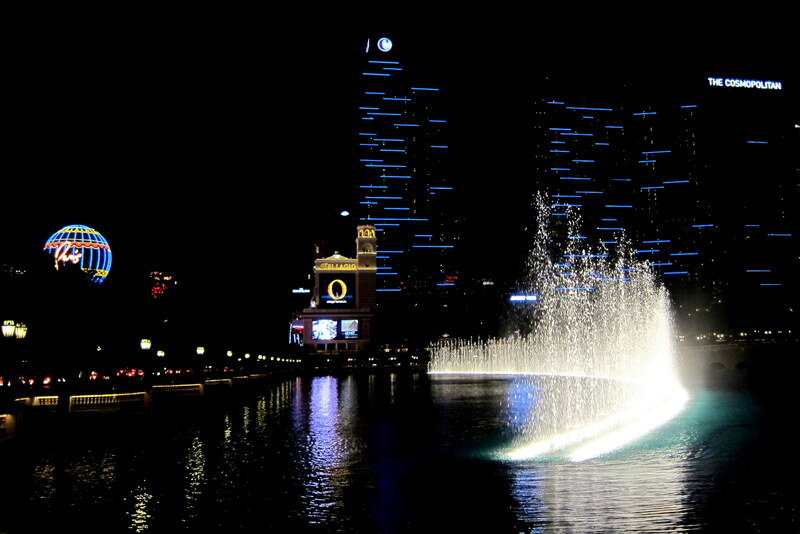 In order to not be outdone The Bellagio lit off it’s its water show with accompanying music. The whole thing was a sensory extravaganza much like a three ring circus; I didn’t know where to watch as it all was unfolding. The Cirque show was outstanding as expected. If you haven’t seen a Cirque performance this is one that showcases the unique Cirque style on an unusual stage. 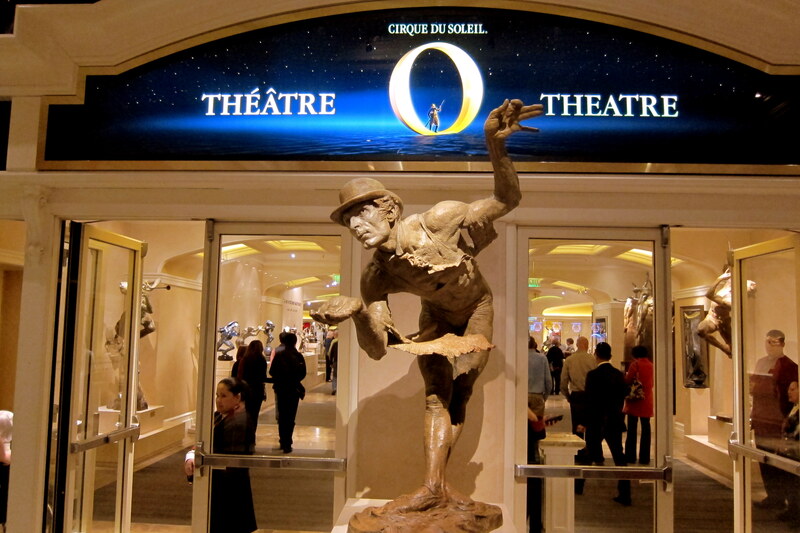 The show has been in residence at the Bellagio since 1998 and still packs the house. Kevin was able to get us prime seats since he works on another Cirque show, Viva Elvis, which we enjoyed last year. There is much more to report from Las Vegas, however I’ll have to continue in Part #2 as this is getting near the maximum download…..stay tuned. Kit’s Corner: As one would expect, this part of our trip is always my favorite. Love hangin out with the grandkids, even though they always glom onto Poppy like Super Glue..LOL. We spent quite a bit of time with them this trip and it’s just amazing not only how fast they are growing but how much they love being with us, considering we only get to see them once or twice a year. Other than the fact that Vegas has “The Strip” with all its entertainment and craziness, life in this town is much like growing up in San Diego. The weather is almost always beautiful, the neighborhoods, schools and shopping areas resemble those in SD and getting around the city feels very comfortable to us. 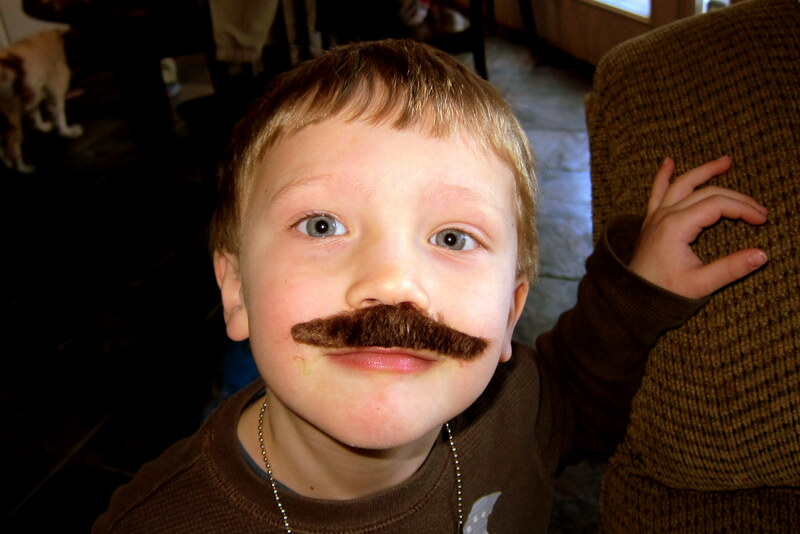 So tell us, whilst making the rounds of Vegas, what is your alter ego persona. Do you walk around with an old surfboard or maybe a battered guitar and claim to have been in the Grateful Dead. I would not be surprised at what an old NC could persuade folks into believing. Yes I do…..but not one of those newfangled wimpy board, I carry a 40 pound ten foot real surfboard. Makes getting in an elevator interesting. Old NC?!?! Who you calling old. I’ll whoop you with my cane, if I can remember where I put the darn thing. Bill, I think you should be a travel consultant for Las Vegas & NV. Sounds like a good fit…..I think Nevada, and the rest of the southwest is great! VERY NEWZEE JOURNAL. I BET THE NASCAR EXPERENCE WAS SPECIAL. I’M SURE THE GRANDKIDS ENJOYED EVERY MINUTE OF YOUR STAY. I SPENT A FEW MEMORABLE TIMES IN SIN CITY. JEAN AND I VISITED THERE ON OUR HONEYMOON EN ROUTE HOME FROM HAWAII 1960. VERY COSTLY VISIT I MIGHT ADD. THE OTHER TWO WERE TO ATTEND THE NATIONAL HORSE HANDICAPPING CONTEST. MY CLAIM TO FAME WAS 108TH OUT OF 500 PLAYERS AND I DIDN’T STICK AROUND TO FIND OUT HOW FAR BACK THE SECOND TIME. BEING THEY DON’T PAY ANYONE FINISHING WORSE THAN 10TH PLACE, I HAD TO RELY ON MY GAMBLING SKILLS TO DEPART THE CITY A WINNER, AFTER ALL MY EXPENSES IE. 500 TO ENTER, PLUS AIRFARE AND LODGING AT CESARS ETC. GREAT TOWN, JUST DONT GO BROKE, THE PIT BOSSES WOULDN’T LOAN YOU A DIME TO CALL A CAB. HA MY BUDDIE DROVE A CAB IN VEGAS FOR A FEW YEARS AND MET ME ON ONE OF THE TRIPS, DRIVING DOWN FROM LA WHERE HE RESIDED AT THE TIME. HE BLEW 8GRAND IN ONE EVENING PLAYING BLACK JACK. RECORD TEMPS HERE, SO MUCH LIKE SUMMER, WE WERE OUT SUNBATHING YESTERDAY AND TODAY. BE SAFE AND LOOKING FORWARD TO YOUR RETURN. WINDY BOUGHT A NEW OB MOTOR THIS WEEK. SAY!! DID YOU TELL THOSE NASCAR DRIVERS THAT YOU KNEW A FAMOUS RACE DRIVER FROM BOWDOINHAM ME.??? Thanks for sharing your Las Vegas stories…..I bet the place has changed considerably since 1960! 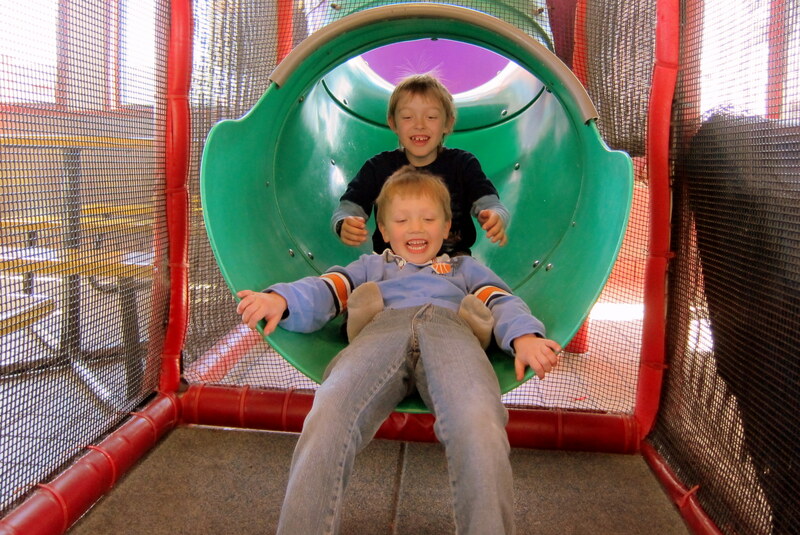 Looks like you had lots of fun with the boys……..and they had lots of fun with you. 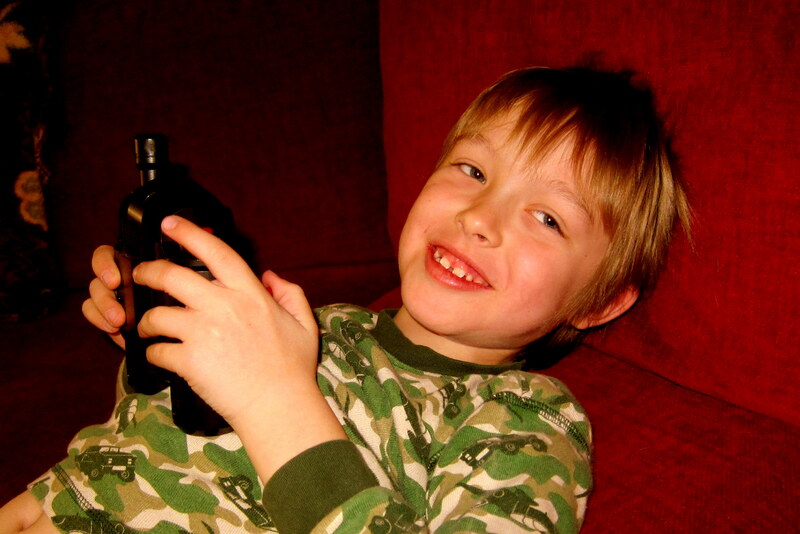 Great pictures, oh, and thanks for sharing the pictures of the kid with the perpetual happy smile on his face! He must have some of the greatest parents in the world to let him try whatever he wants and enjoy the activities that his friends enjoy. Every kid needs that. Enjoy the rest of your trip. Thanks we will….you guys do as well!